Expect to feel fantastic when you see a much flatter tummy and skinnier waist. The lower abdomen in particular tends to be resistant to diet and exercise, making even the most fit and active individuals insecure about their appearance. This is especially so when weight gain, heredity and caesars result in development of large tummy overhangs (aprons). Untreated, they can cause complications such as severe rashes and infections. 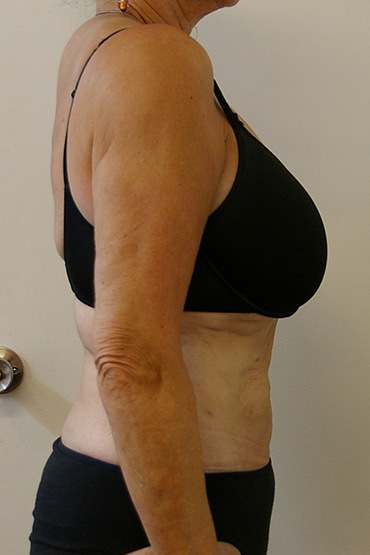 The tendency is to think that a “tummy tuck” is the treatment of choice, however Dr Goldbaum has achieved some impressive results of successfully treating these tummy aprons with liposuction, thus eliminating the need for hospitalisation, general anaesthetic and large unsightly scars seen after surgical tummy tucks. It is common to combine liposuction to the tummy, with liposculpture to the hips and waist. During liposuction the majority of fat is removed and liposculpture can contour your body into a nice shape that could also slim down your waist and hips. It’s best to make an appointment with one of our Consultants to discuss your goals.